West Virginia became a state June 20, 1863, the 35th state admitted to the Union. Only a few weeks after Col George Clendenin purchased land in the Kanawha River valley, he was instructed by the governor of Virginia to organize soldiers to protect the area from native raiding parties. He built a stockade on some of his land near the river; it was officially named Fort Lee but was commonly known as “Clendenin’s Settlement.” By 1794 so many settlers had come due to the security of the fort, the Virginia Assembly authorized the creation of a town. Charles Clendenin, father of George, had been buried inside the fort in 1790; the town was named Charles Towne and shortened to Charleston in later years. Salt manufacturing was the first industry here; Kanawha Valley salt was being shipped to all parts of the country by the mid-1800s; development of the coal industry began after the Civil War. The city also was an important transportation center for east-west travelers. During the Civil War, the people west of the Appalachian Mountains decided they did not want to support the Confederate cause, as Virginia did. On June 20, 1863, West Virginia entered the Union, with Wheeling as the first capital city. Although moving several times between Wheeling and Charleston and back to Wheeling, state government was permanently located in Charleston in 1885. After utilizing temporary structures that wound up being destroyed by fire, a commission hired architect Cass Gilbert to design the capitol building in use today. Built between 1924-1932 in Italian Renaissance style, it has a gold leaf dome 300 feet high. Inside hangs a 10,080-piece hand-cut crystal chandelier that weighs two tons. On the banks of the Kanawha River next door to the capitol is the Culture Center, housing the State Museum and State Archives; Mountain Stage, a live public radio show airing nationwide to more than 150 stations, is broadcast from the Culture Center Theater. The area is well loved for the hiking, skiing, horseback riding, fishing, canoeing, kayaking, and whitewater rafting available on the Elk River and in Kanawha State Forest. 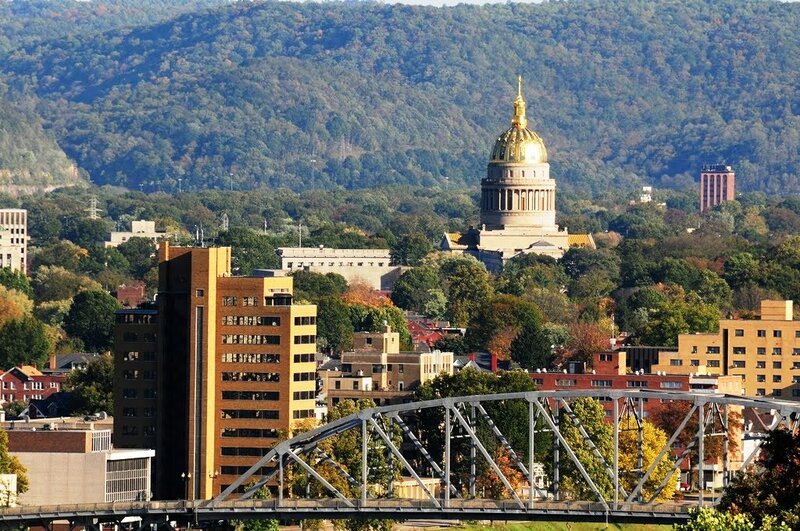 The pioneering tales; time-traveling in the state museum from Boone to building bridges everywhere; the hairpin roads to houses on the mountainsides; the capitol’s striking golden dome and stunning river view; the airport on the mountaintop. Mountains near: Appalachian, Allegheny. Spruce Knob, in the eastern part of the state, is the highest point in West Virginia at 4,863 feet.